2017 Azimut 55S including Passport Premiere Platinum Transferable 6 Year Extended Warranty - Azimut's Superstar Express-Newly Listed-Ready to Go in Miami Silver Metallic Hull Paint with Williams Jet Tender and Seakeeper Gyro Stabilizer, Triple Volvo IPS 600s with approximately 250 hours on engines. Stored Indoors for the Winter. Original Factory Options: Miami Silver Hull Paint, Bow Thruster, Cockpit Cabinet with BBQ, Refrigerator and Trash Compartment, Cockpit Manuevering Station/Joystick, High Gloss Wood High/Low Cockpit Table with Snpad Filler Cushion, Co-Pilot Seat at Helm, Crew Cabin with Air-Conditioning, Skyhook Dynamic Positioning System,Electric Sunshade Awning for Aft Cockpit, Flagpole, Floodlights for Aft Cockpit,Glendenning Cable Master, High/Low System for TV in salon, LED Lighting for Interior and Exterior with Dimmers-salon and cockpit, Screens for portholes, Raymarine Platinum Electronics Package, Raymarine T270 Thermal Night Vision Camera, Safe in master cabin, Convertible Salon/Dinette seating with adjustable chaise lounge, Seakeeper Gyro Stabilizer, Set of linen (crew and all cabins), Sunbathing Cushions on Bow, Sunroof with Glass Panels, Teak Deck on swim platform, Teak on garage door/ second swim platform,Teak on sidedecks, Hydraulic Gangway, Venetion Blinds in Salon, Washer/Dryer combo unit, Wooden Floor in salon and dinette-satin finish, Advanced Package:Chaincounter, Dual Racors, Electric winches inccockpit, External Covers and Closure Curtain for garage, Miele Appliances (convection microwave and cooktop), Racor filter for generator, Shore water inlet, Spare conduits and Cockpit Side Boarding Gates, SST Handrail on exterior side decks, Additional Storage Cabinets above galley, Cockpit Refrigerator-drawer type below aft seat, Electric Shade for interior salon sunroof, Delete China-Add Storageunder helm seat and Decor Upgrade. Installed Locally: Chip for plotter, Marquipt Side Boarding Stairs, Two Azimut Deck Chairs. New Boat Warranty from in Service date of 5-5-17. The vessel also has a Passport Premiere Platinum6 Year Transferable Extended Warranty. This is a brokerage boat so no trades please. Call for an appointment and showing today. Stored Indoors for the winter. United Yacht Sales New Jersey would love to guide you through a personal showing of this 55' Azimut 55s 2017. 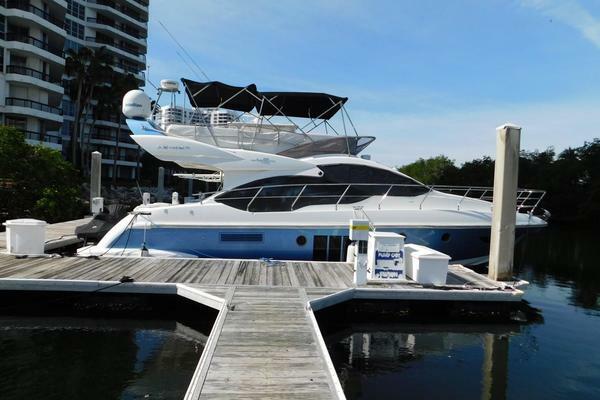 This yacht for sale is located in Huntington, New York and priced at $1,479,000. For a showing please contact us by filling out the form on this page and we will get back to you shortly!